Purchasing is easy. You can email/text an order. You can call me to discuss items you're considering or have questions about, and then place an order. You can provide me a dollar limit and ask me to select pieces for you. Now, ordering is even easier with an electronic shopping cart and payment via PayPal. I have credit card payments via Stripe checkout temporarily disabled (because of their high fees and lengthy time they take to pay me), but of course you may designate your credit card as PayPal default method of payment. 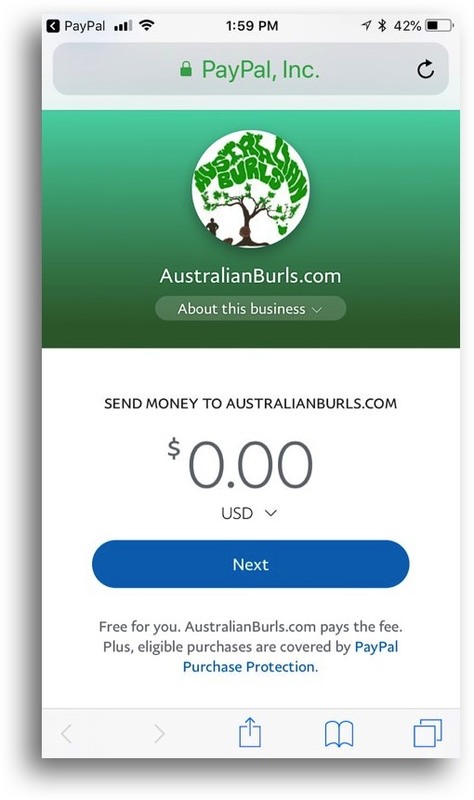 Now, you may also pay via my PayPal.Me link at https://www.paypal.me/AustralianBurls. 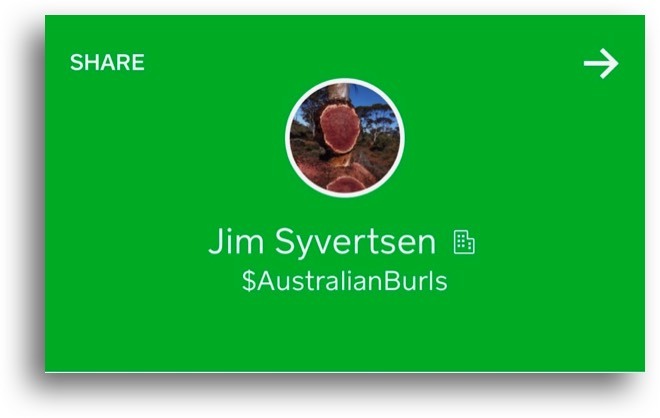 You DO NOT need a PayPal account to pay via PayPal, but if you prefer to pay via credit card, I'll be happy to send a Square Invoice (sample shown below) so you may pay securely. You may purchase and pay for items individually or add to your shopping cart and check out when you're finished shopping. Please be aware that putting items into your shopping cart does not remove those items from inventory. 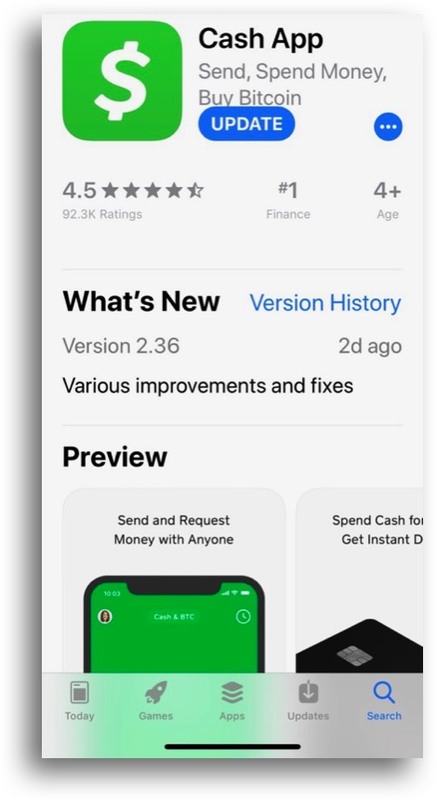 That is done by manual update of the website as soon as possible after a purchase notification. Please read the Cart notes, specifically regarding applicable discounts and billing for shipping via separate e-invoice for applicable orders. For all but wholesale orders, I accept all payment methods - PayPal, Credit Card, Apple Pay, Check or Bank Transfer. 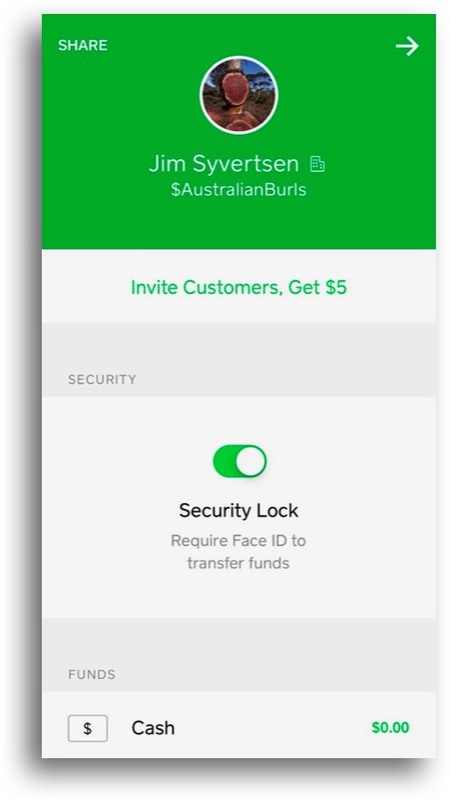 Payment type is always customer choice, but offered the option, I'll always accept a check or bank transfer. 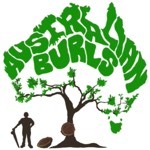 Payment for wholesale orders is by wire transfer or certified bank check only. 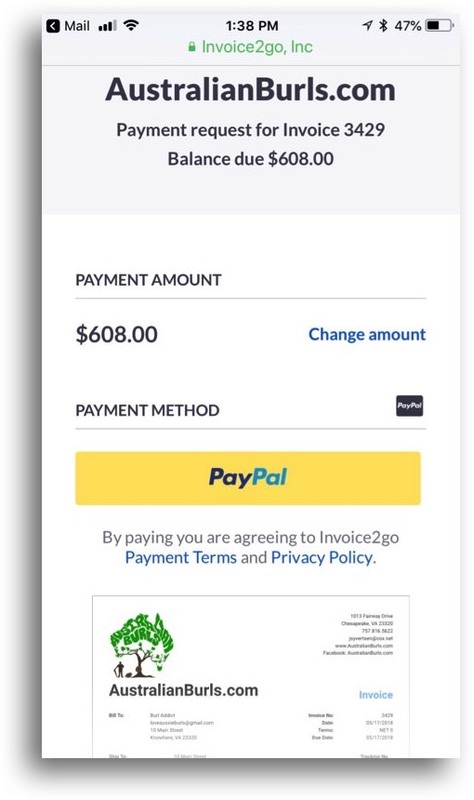 Once I've packaged your order and generated an invoice within my Invoice2go app, you will receive an e-invoice for shipping cost (if applicable). If your order is eligible for FREE Shipping and you've paid online, I'll send a PAID invoice. Payment in full is due upon receipt unless I've agreed in advance to some alternate arrangement. 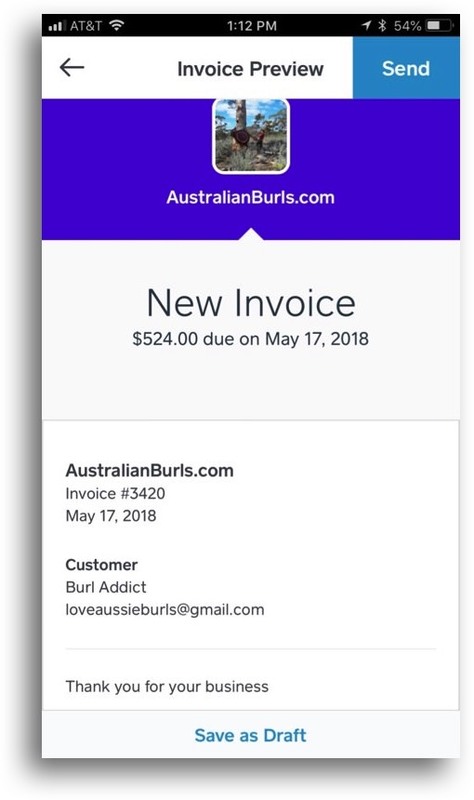 As shown below, in the email you receive, you will see an Invoice # from AustralianBurls.com in the subject line and a "View Invoice Summary" button and pdf copy of your invoice in the body. Please click on the button. You will then see the payment options available. 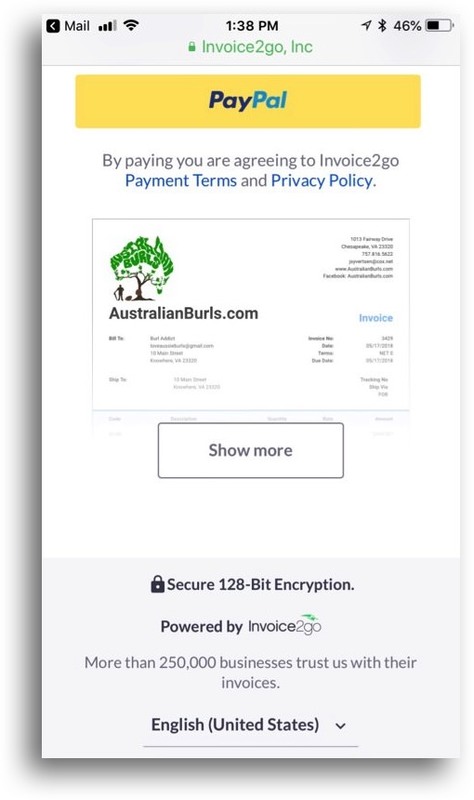 Alternatively, you may also click on the pdf copy of the invoice and then click on the Pay Now button. Please read the Notes at the bottom of the e-invoice. As noted above, payment is due when your order is prepared for shipment and I send your e-invoice. If you are paying by check, I will not delay shipment of your order, but please mail your payment that day. Please also note my policy on returns, refunds, exchanges and credits. This is the type e-invoice you will receive from me if you order via phone, text, email or for shipping cost (if applicable to your order). 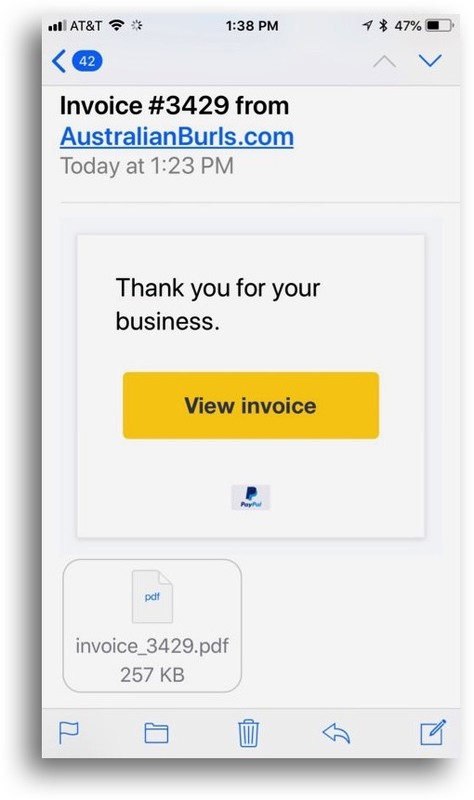 PayPal payment request you'll see when you click on the View Invoice button. 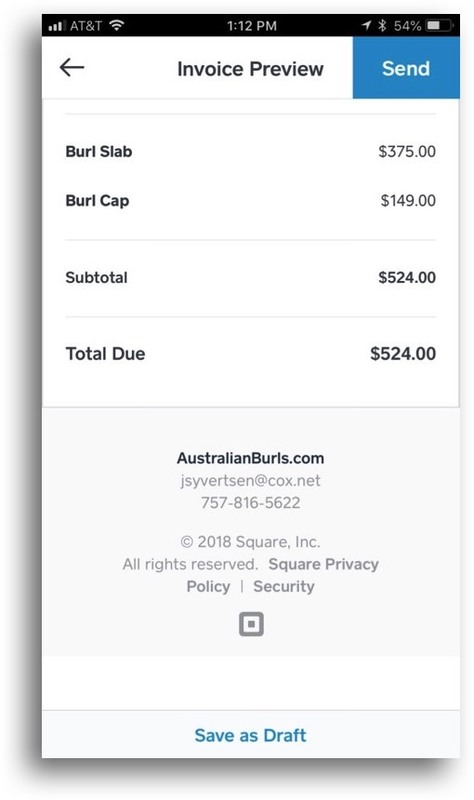 Should you prefer to make payment via credit card, you will receive a Square invoice like this for secure online payment.